The first thing you’ll notice after first boot is that this LG G Pad isn’t running LG’s bloated clunky software, instead it’s running bare bones stock Android. Out of the box this tab utilizes the latest version of Android 4.4 Kit Kat which runs super smooth. 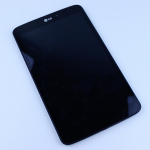 Now the LG G Pad isn’t a Nexus device, instead it’s a Google Play Edition. The easiest way to explain a google play edition handset is that it gets the super high end hardware of the best devices out, while also running the best Android software, stock Android. Another great thing is that the Google Play Edition G Pad will actually receive updates faster than the standard G Pad, which is always nice. As far as Android 4.4 KitKat goes, not much has changed in what Android can do, but instead it places a bigger emphasis on Google Now and cleans up the design of the OS with larger icons and updated navigation systems. The build quality of the G Pad is really superb. It features an iPad esque dark aluminum slate backing that feels nice to the touch, but definitely is a fingerprint magnet. I also feel like the G Pad is just crafted really well with an immense amount of attention to detail. The volume rockers are ultra precise, very tactile, and feel very premium. The main thing I was wondering about the G Pad before I got it was if it was usable with one hand like the Nexus 7, because if it isn’t then you might as well get a 10 inch tablet. Luckily I haven’t had any issues palming the device in one hand, in fact, the bezel is just large enough to navigate around the device. The Nexus 7 is a pretty narrow tablet which makes it perfect for reading books and magazines with one hand, but quite honestly, I haven’t been picking up the Nexus 7 as much since I’ve gotten the G Pad. I get almost the amount of portability of the Nexus, but I get a lot more screen real estate to work with. When it comes down to the actual size of the G Pad it’s 216 mms in height and 126 mms in width. The G Pad is real nice and thin and as far as the weight, it’s 338 grams which makes it only several grams heavier than the retina iPad Mini. The LG G Pad 8.3 Google Play Edition both features the same 1900×1200 display as the 2013 Nexus 7 but of course the LG G Pad’s is a bit larger which means the pixel density is a bit lower. The G Pad does have an ultra crisp and high quality screen, but I have noticed it’s significantly dimmer than the Nexus 7 and iPad. The battery on the G Pad was pretty good. I went several days with medium usage with the screen on auto brightness. Thanks to the Snapdragon 600 processor and 2GBs of ram, the G Pad flies through graphic intensive games and glides through whatever I’ve thrown at it. Even after loading up Dead Trigger, Shadowgun, and all those things I didn’t experience any noticeable lag. Now when it comes to a tablet or really any major purchase you make price is definitely going to be a factor. The LG G Pad Google Play Edition costs $349 which is pretty steep considering the Nexus 7 2013 can be had for about $150 less. However, with the G Pad you do get the larger screen and a micro sd card, so it’s definitely enticing for those that need expandable storage. The LG G Pad 8.3 is really a fantastic tablet, I’ve really loved the stock android experience and the high quality build, but it’s definitely tough to justify the high price tag. If you have the extra money to spend definitely check out the Google Play Edition G Pad, I would highly recommend it. 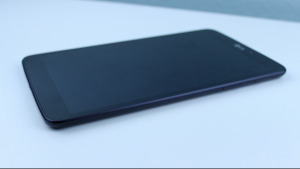 Anyway, hopefully this review helped you out, and if it did please check out my review above.